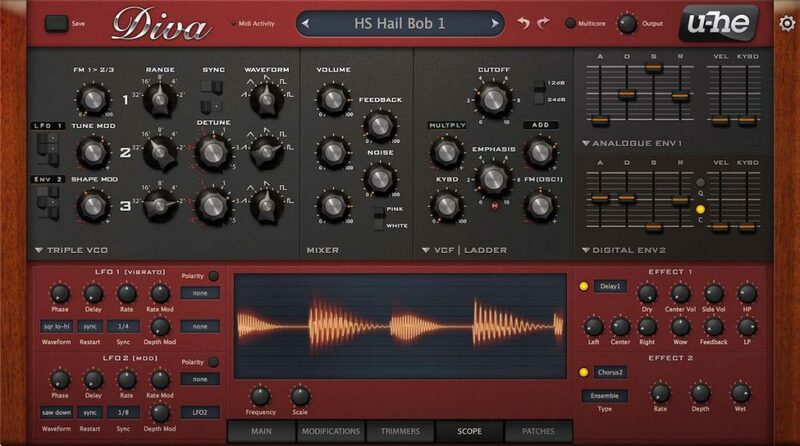 Diva is a spectacular virtual analog synth made by U-he. The name is a short for Dinosaur Impersonating Virtual Analog Synthesizer. The idea was to emulate the sound and the features of some of the greatest hardware synths of all times, like Roland’s Jupiter 6, Jupiter 8, Jupiter 60 and Alpha Juno, Korg MS20 and Moog Minimoog D.
Diva has lots of cool features, a warm and stunning sound, and infinite programming possibilities. It really does its job. However, as most U-he products, it’s highly CPU-demanding. Because of that, the user can choose between four resolution modes: divine (the most demanding for CPU), great, fast and draft. The best mode to run the synth will depend on how fast is your computer. The synth sounds warm, authentic and expressive – it really makes you go back to those old times of analog synths and spend hours tweaking the knobs. The interface shows the control bar at the top. The Save button will allow the user to save patches. Midi activity is a led which will display Midi data received. The data display will show the current patch and also any current value of a selected parameter. Diva comes with about 1200 patches, so the first thing to do is to explore them. The control bar also has Undo and Redo buttons, a Multicore switch (which will distribute the voices through the CPU cores) and a global Output volume. The U-he badge will show links for U-he website, social networks, and also user guide and support forum. The gear button at the top right will open the midi learning feature, midi settings, and preferences. The upper panel contains sections for oscillators, filters, and envelopes. At the left, there’s the oscillators section. 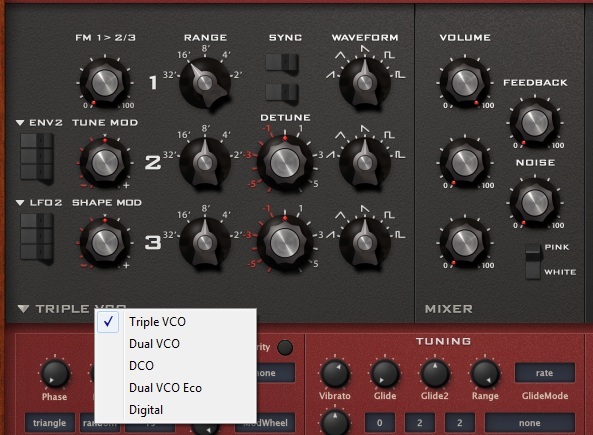 Click on the oscillator’s name to display a drop-down menu with all the available oscillator types: Triple VCO, Dual VCO, DCO, Dual VCO Eco and Digital. Each type will have its own layout and parameters. Triple VCO is the most complex of them, and it’s similar to those found on Minimoogs. Dual VCO is an emulation of Roland Jupiter 6 and 8. DCO was found on Roland Alpha Juno and Juno 60. Dual VCO Eco is the emulation of Korg MS20 oscillators. Digital is the one from Roland JP8000. It’s interesting to switch between each oscillator type and notice how the sound changes. Next, there’s the HPF section. Similarly, clicking on its name will open a drop-down menu. It’s possible to choose between Feedback, HPF Post, HPF Pre, and HPF Bite. The Filters section has the following options: Ladder, Cascade, Multimode, Bite and Uhbie. Each one has its own settings, and it’s impressive how different each one can sound and how deep you can shape the waveforms. 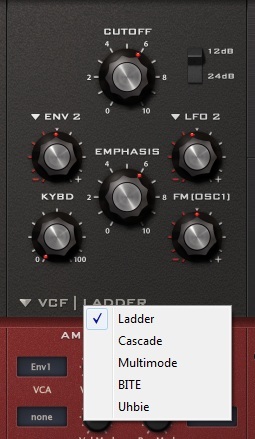 Ladder is the filter found on Minimoog D (notice that the resonance parameter is called Emphasis). Cascade is from Roland Juno 60 and Jupiter 8. Multimode is from Roland Jupiter 6. Bite is from Korg MS20, and Uhbie is found on Oberheim SEM. The Envelopes section shows two envelopes that can be routed to several parameters. Diva comes with three types of envelopes: ADS, Analogue and Digital. You can choose different envelope types to the same patch. Diva’s architecture lets the user mix between all types of oscillators, filters and envelopes, and the results are awesome. In the lower panels, there’s the LFO section, with 2 LFOs (at the left). There’s also an Effects section in the lower right, with two available slots. It’s possible to choose between 5 effect types (Chorus, Phaser, Plate, Delay and Rotary). The Tuning section will allow the user to make settings on Vibrato, Glide and Glide Mode settings. There’s also options to fine tuning, transposing and micro tuning. The Amplifier & Pan section will have controls for Volume and Pan, as well as knobs for volume and pan modulation. Click on the boxes at the side of each modulation knob to open the routing options. 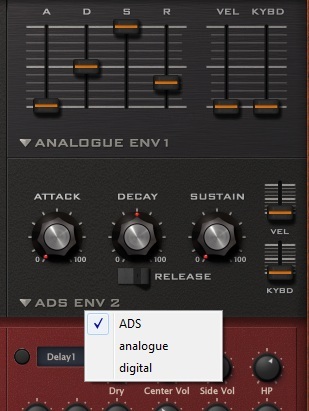 Diva also comes with an arpeggiator (which was missing in early versions). 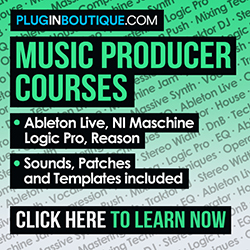 It has six arp modes and four progression types. The synth also includes a scope, so that the user can view how the waveforms are being modified. 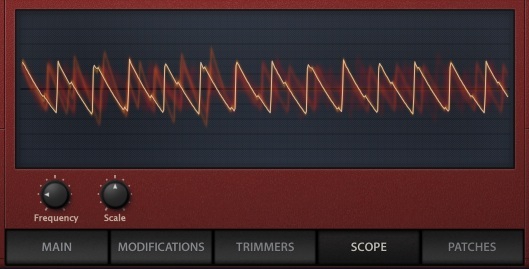 It’s possible to tune even deeper all oscillator voices through Trimmers screen. Modifications screen includes more modulation options for several parameters, so you can stay modulating for hours and hours and end up with great sounds. Diva runs on PC and Mac computers and is available in AAX, AU, NKS and VST versions. It has 32 and 64-bit formats.